Marshall County was well represented at the Elks State Hoop Shoot in Frankfort on Saturday, February 11th. Marshall County Elks Lodge #2707 are proud to announce that Elin Denfip was a 2nd place winner and Rylee Teague and Neyland Jezik placed 1st in their age groups. 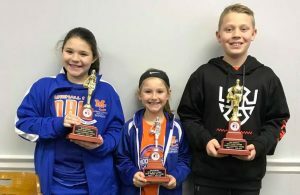 The first place winners will advance to the Elks Regional Hoop Shoot which will be held in Paducah at Paducah Tilghman High School Gymnasium March 15-17. The Paducah Elks Lodge is sponsoring the event. In the event that the 1st place winner cannot make it to Regionals, the 2nd place winner will take their place.